Born in LaPorte, Indiana, Reed was a three-sport star in high school. Basketball was his first love so he turned down a bonus offer to sign a baseball contract and accepted a basketball scholarship from the University of Notre Dame. A 6’6″ forward, he averaged 19 points and 14.3 rebounds a game for his career (1962-65). Along the way he set the Notre Dame single season rebounding record averaging over 17 a game. Drafted in the third round by the Detroit Pistons he played two seasons and averaged 8.5 points and 7.5 rebounds a game. Reed was also drafted by the Milwaukee Braves playing both sports for two years then decided to devote full time to baseball. He pitched 17 seasons in the Majors with the Braves, Cards, Phillies and White Sox. A starting pitcher for the early part of his career he was converted to a relief pitcher in 1976 when he was traded to Philadelphia. 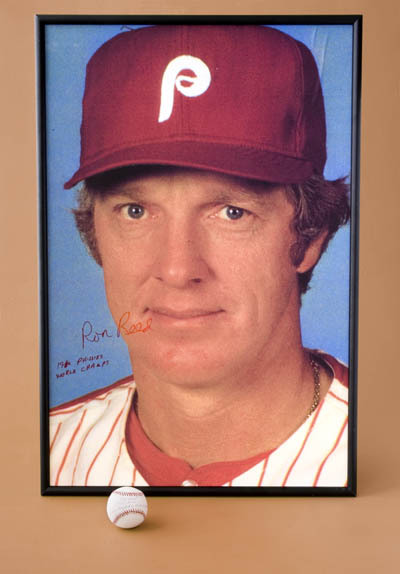 He saved game two for the 1980 World Series Champ Phillies. He ended his career in 1984 with 146 wins, 140 losses and 104 saves. Sometimes even life’s most critical decisions are the easiest to make. If not the best decision of his life, it certainly was the wisest. Reed combined his reliable right arm with his insatiable appetite for competition to create a major league baseball career that covered 17 full seasons and part of two others. And he’s never wasted a moment wondering what might have been. Born and reared in the basketball crazed city of LaPorte, Indiana, Reed’s boyhood passion was to rewrite the NBA record books. He was well on his way when he earned a full-ride basketball scholarship to the University of Notre Dame. His distinguished Irish career earned him a spot on the school’s all-time best 25 players list. Following graduation in 1965, Reed was drafted by Detroit and played two seasons for the Pistons. At the same time, Reed spent off-seasons pitching in the Atlanta Braves minor league system. In 1967, his pitching prowess skyrocketed. He jumped from Class A to AA to AAA to one month in the big leagues. The following season, he re-terrorized Class AAA hitters and again was called up to the Braves for another September stint. He never returned to the minor leagues and his basketball career was officially finished. In 1968, he began a big league tour that included appearances in six League Championship Series and two World Series. His career didn’t end until after the 1984 season. That may be as understated as the fastball flying from his 6-foot-6-inch frame that kept all enemy hitters on their toes. Reed’s big league longevity certainly proves he knew where he belonged. Reed was a starter for the Braves into the first half of the 1975 season when he was traded to St. Louis. During the off-season, he was traded to Philadelphia where he was converted into a reliever. 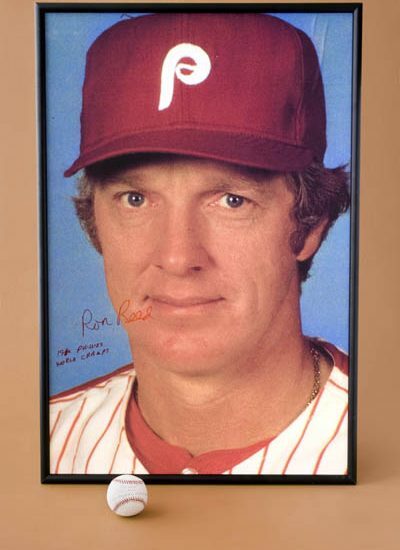 Reed accepted the new role that figured prominently in Philadelphia’s run of five League Championship Series and two World Series appearances from 1976 to 1983. In 1980, the Phillies beat Kansas City for the world championship. Reed flourished in his new role. In eight seasons with the Phillies, he appeared in at least 60 games four times. Except for 39 games in 1981, he never appeared in less than 55 games. Looking back, Reed appreciates how the move lent to the Phillies’ success. Of course, there are countless other memories too numerous to recall. One that remains alive and cherished, however, occurred on April 8, 1974, when he was pitching for Atlanta. That’s the night Hank Aaron hit his 715th home run to pass the legendary Babe Ruth. For his career, Reed finished with a 146-140 won-lost record. He had a 3.46 ERA and 103 saves. In two appearances in the 1980 World Series he posted a 0.00 ERA with one save. One of Reed’s grandmothers was of 100 percent Polish extraction. His late father was half Polish. Reed, instead, will do the smiling for Dad. So are Dad and the rest of the family. Ron Reed did enough to make everyone proud.